Nope, I haven’t been to Singapore yet, but three of my family members have already set foot on the Lion City. My sister Meann went to Singapore with his husband May of last year for both business and pleasure. 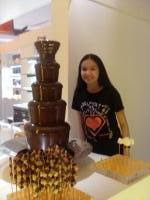 Tin-tin, my niece, left for Singapore last April for a 6-month sponsored on-the-job-training at Shangri-la Hotel. Her practicum ends this October, and she might go back, God willing, for a possible employment this time. Ed, my husband, went there summer of this year courtesy of his company for a disaster recovery testing of their offshore site. He wanted me to go with him, but I couldn’t last a day without my son, so I decided to stay. A few days from now, it’s my youngest brother’s (Dennis) turn to try his luck in Singapore. I hope everything goes well with him. Good luck, bro! My prayers and good wishes are with you.